Special Deal. Buy 6 Bottles for £50.00 each. Save £30.00 !! Single Bottle Price - £55.00. Like a spring rose petal this wine has a remarkable golden-pink hue. It has beautifully delicate bubbles that caress the inside of the flute with undying finesse. The nose is fine, subtle, fresh and spring-like, evoking fragrances of red fruits, cherry, raspberry, wild strawberry and red berries. Their relatively young primary aromas present a wonderful bouquet. On the palate the first impression is balanced and fresh. The wine is supple, round and silky on the palate, developing fruity notes, with a deliciously bold finish. 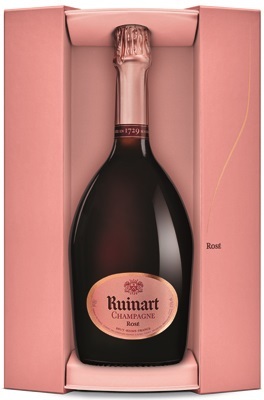 Ruinart Rose NV is created using a precise blend of exceptional grapes. It is made of 45% Chardonnay from the Cotes des Blancs and 55% Pinot Noir from the Montagne de Reims. Ruinart Rose NV can be served either as an aperitif with beef carpacio or a delicious accompaniment to pink duck breast with cranberries, bluefin tuna sashimi or a leg of milk lamb. For dessert makes an ideal complement to redcurrant and raspberry macaroon. The Ruinart House was officially created on 1st September 1729 by Nicolas Ruinart, a bold entrepreneur. In penning the founding document, he was realising the dream of his uncle, the Benedictine monk Dom Thierry Ruinart, to make Ruinart the first Champagne House. Down the centuries the House has always fostered a culture of excellence, as embodied by the fundamental values of authenticity, openness, refinement and quality. This quest for perfection is particularly illustrated by the predominance of the Chardonnay grape, which is included in the composition of the whole Ruinart range and of the prestigious Dom Ruinart champagnes, flowing through them and enhancing them like a golden thread. The Chardonnay illuminates all these wines, exalting their brilliance and creating the particular fluidity that makes them so distinctive. These qualities have perpetuated Ruinart's culture and style over the years, making it today the aesthete of champagne that is recognised the world over. Since 1729, Ruinart has been creating its champagnes in the same spirit of innovation, purity and timeless elegance - it is this 'Signature' which has become a characteristic trait of the oldest champagne house. Full bodied, supple and extremely smooth, Ruinart champagnes combine delicacy, and subtle freshness. The Ruinart taste is a radiant alliance of the distinctive flavours of the predominant chardonnay - the elegance of the grapes from the Côte de Blancs and the character and body of those from the Montagne de Reims. With the finest grapes, skilful blending, extensive ageing in its 2000 year old cellars, and a uniquely shaped bottle, Ruinart defines its commitment to excellence and luxury.